Today marks what would have been Julia Child's 100th birthday. She's a bit like America's culinary mother, the woman who encouraged and cajoled us into the kitchen to be become better cooks, with her humor and her can do attitude. 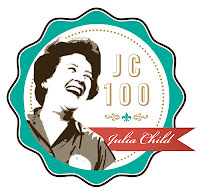 I wish I had a great personal Julia Child story, but alas, I don't. I can only share that like so many others, I have collected her cookbooks, cooked many of her recipes and thoroughly enjoyed watching her on TV. Right now I am in the midst of reading Dearie: The Remarkable Life of Julia Child, the most comprehensive biography of Julia Child, written by Bob Spitz, someone who not only knew her, but admits to having had a crush on her. 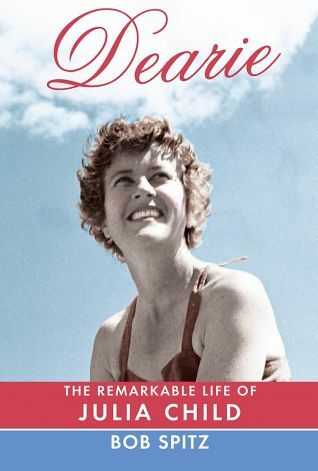 It's over 500 pages long and includes lots of anecdotes but it's really her character that shines through in the book and makes it such a good read. You can read an excerpt online. Also on my nightstand is a children's book that features Julia Child. 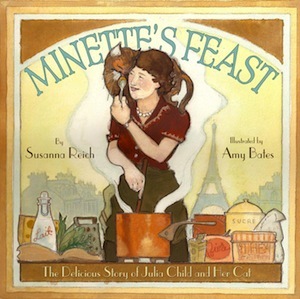 Minette's Feast has illustrations that are somewhat reminiscent of Maurice Sendak. The book is short, perfect for bedtime reading. 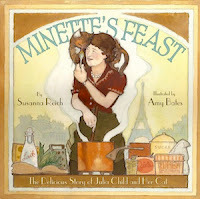 It incorporates tidbits and quotes from Julia Child, but it's really just the backdrop for a fictional story about her cat. It's light and fluffy (kind of like the cat! ), and it will definitely please very young children more than adults, unlike Bon Appetit: The Delicious Life of Julia Child, a children's book for slightly older kids, that I believe all Julia Child fans will relish. and don't miss Jacques Pepin's charming recollection of Julia Child, it was published in the New York Times, yesterday.